Board members said they wanted to let the public weigh in on new information about the project's potential impact. State officials said they were still determining when the vote will be scheduled. The delay is the latest setback for the planned 600-mile Atlantic Coast Pipeline, which would carry fracked natural gas from West Virginia into Virginia and North Carolina. Last week a federal appeals court threw out a permit for the pipeline to cross two national forests, including parts of the Appalachian Trail. "While we're disappointed with the additional delay, we're confident the board will approve the permit after considering all of the facts," said Dominion Energy spokesman Aaron Ruby. Dominion is the pipeline's lead developer. 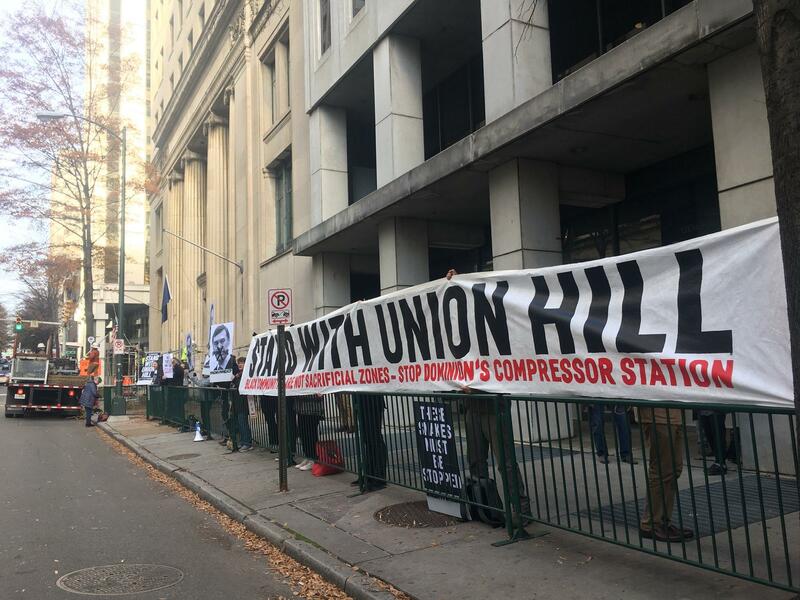 The proposed site for the compressor station is in Union Hill, a community founded by freed slaves. Opponents of a pipeline compressor station rally outside Wednesday's meeting of the state Air Pollution Control Board. Opponents worry that exhaust from the compressor station will hurt the low-income and elderly residents who live nearby. Others have supported the station as a way to boost development in the area. Dominion has offered to spend $5 million to help make improvements in Union Hill. Dominion has said it chose the location because it had sufficient acreage for sale and intersects with an existing pipeline. The air pollution permit has become a flashpoint in the yearslong fight over the pipeline, which supporters say is needed to help boost the supply of natural gas and opponents say is unneeded fossil fuel infrastructure project that tramples land rights and hurts the environment. Gov. Ralph Northam angered environmentalists, including some close supporters, and minority groups when he replaced two members after the board delayed a scheduled vote in November. Northam the move was entirely unrelated to the compressor station vote and the members were replaced because their terms had expired. The two new members did not participate in Wednesday's hearing and it's unclear if they will participate in the upcoming vote. Protesters at Wednesday's meeting yelled, booed, chanted and hissed throughout the meeting. Some held signs denouncing Northam, a Democrat who has not taken a firm position for or against the pipeline. Harrison Wallace, Virginia Director of Chesapeake Climate Action Network, applauded the board for "taking the time to fully consider" the compressor station's impact. "With all of the facts at hand, we're confident the air board will have no choice but to stand tall in the face of this egregious injustice by rejecting its required permit," he said. Environmental activists are calling foul after a sudden decision by Virginia Governor Ralph Northam to remove two members of Virginia’s Air Pollution Control Board.